All the way over, way out there, is the granddaddy — Slide 4. If you manage to stay on the traverse and get past Slide 3 you must maintain focus and speed to make a short uprun through the krummholz. If successful you’ll come out onto the top of number 4. Looks are deceiving: Slide 4 is steeper than you think but the top is a slide path not a chute. So, even though spruce and balsam are re-vegetating, there still is plenty of room to maneuver. The tree cover also helps to hold snow and it can get deep in Slide 4. Something else to consider, the top zone is relatively open and its aspect soaks up sun so the snow does get heavy faster. It’s good to be in the first wave on Slide 4. There are multiple lines, so that it’s almost a free-for-all down the slide path zone. 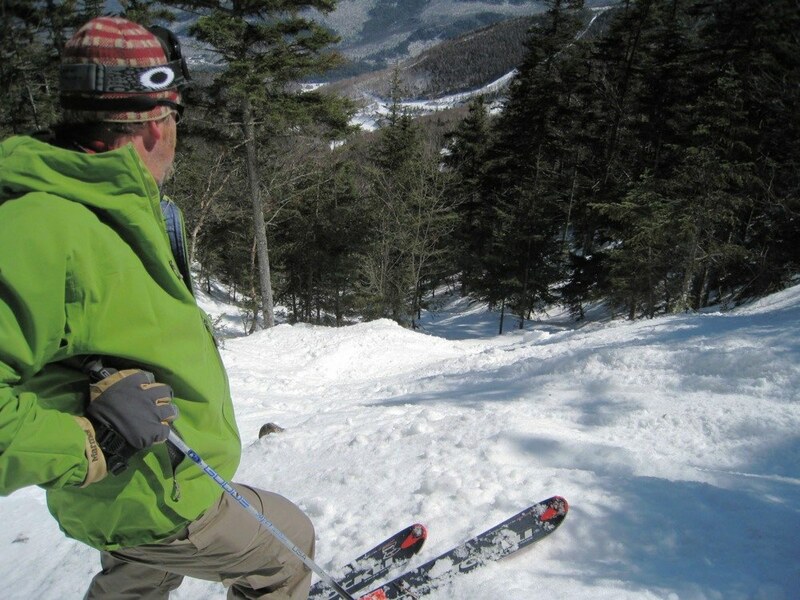 Strong skiers can string together a nice set of GS turns moving from open area to open area. As you descend, the krummholz encroaches from both sides and the slope steepens. At this point check your speed to stay in control. The middle, tighter section of Slide 4 transitions into a short S shaped chute before morphing into a full-on gully. As you enter the chute there is a nice rock drop on ripper’s right. Carry some speed — but not too much — to clear debris and then angle hard left to avoid an abrupt dead end. You can also hop turn past the boulder by remaining in the center of the S chute. Once past this feature, you’ll need to make a couple more quick turns before the lights go out and the marathon begins. Below the middle chute the slide narrows into a gully of darkness that is less than ten feet wide. This gully rips right down the fall line. If you are fortunate to be in the first wave, on the right day, face shots are a real possibility. This single line gets chewed up quickly so it can also be a series of quick turns, jump turns and side slipping. The gully also holds three or four ledges. The first two are short and easily dropped or side slipped. Towards the bottom there is a ledge of significance which could break bones if the landing is exposed or packed out. Look before you leap! Here you are close to the end. From this point the gully flattens and widens a ski length or two. Keep your eyes peeled for a single track traverse on rider’s right which will bring you back to the “bottom of slides” just above Slide Out so you can, slide out. Getting sucked low will result in expenditure of energy wallowing up slope.